Redken Guts 10 is specially formulated to give you all-over volume and fullness, so you can create gutsy, show-stopping styles. Offering medium control and suitable for all hair types, this volumising foam lifts the roots to create flexible structure. A great multi-tasker, it also controls frizz and flyaways for added smoothness, whilst feeling natural in your hair. The directional spray will also allow for precise application. - L.M. Hair is clean and you don't feel something in hair. Hair is good and soft. Great product adds volume and arrived promptly with free delivery - v pleased. Couldn't live without it! Never found another product like it. Gives body and still have shiny hair. So easy to use and not sticky. Would recommend to anyone who wants a style to last. excellent product, does all it says, will buy more soon. have told all my friends how good it is, also the price. Redken Guts 10 is an amazing product. 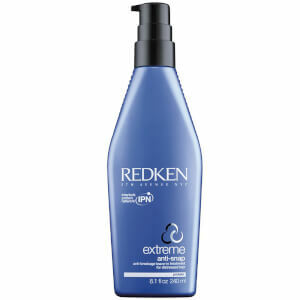 This spray mousse volume was recommended by a friend, It gives fullness and body, without being sticky. A must for very fine hair..
My haidresser recommended this product and I must say that it does add volume when I blow dry my hair. Easy to spray on roots before drying - I would certainly recommend it. Excellent product. Easy to use and direct - it goes straight to roots to give lift and body.